It's hard sometimes juggling everything. Looking after two young children. Organising our home. It often feels like I just don't have enough arms to do everything I need to. It's especially hard now that Ollie is at an age where he wants to do more and I can't just pop him down on a playmat to keep him entertained whilst I concentrate on doing older activities with Lily. I'm sure I did a lot more with Lily at this age, I know we certainly did more sensory activities and messy play. So my aim in the next couple of months is to find more activities that are suitable for a baby whilst also being fun and challenging for a three year old. Easier said than done perhaps, but I'm up for a challenge. Luckily, it's a good time of year for staying in a little bit more. I usually like to get out every morning, but I'm anticipating the S-word in the next week and I'm not dragging myself, two kids and pram far in the wet slushy stuff for long. Playing in the snow does, however, appear in my list! 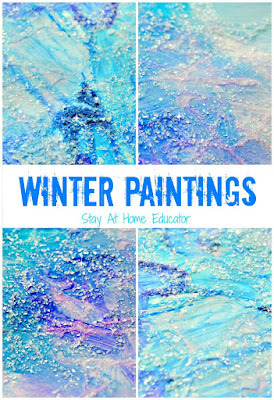 I particularly like the idea of this project that I found at the Stay at Home Educator via Pinterest. The colours and glitter will appeal to Lily, and because there isn't too much skill involved, I'm hoping it will be a fun, messy activity for Ollie too. I may even make my own edible finger paints as I haven't done that since Lily was a teeny baby. I like the idea of using greek yoghurt rather than various flour-concoctions as it seems a lot easier. There are so many ideas out there for child friendly bird feeders, the difficulty is not in actually doing it, but deciding which one to do! I'm thinking that this will need to be a team effort - Lily and I doing the harder bits whilst Ollie helps with pouring, mixing etc. It did snow this morning, but it was nearly all gone by lunch. I'm hoping for more snow so we can get out and properly have some fun! Lily is desperate to build a 'proper' snowman as we didn't have much snow last year and when we did she was poorly with chicken pox and only managed this effort. I spoke before Christmas about how much I love planning different sensory play activities and another easy but satisfying option is jelly. I'm thinking of making a rainbow of jelly cubes for play, with the added bonus of having some left over for actually eating! Whenever I'm truly stuck for something to do, I always fall back on making some fairy cakes. I can make them in my sleep and yet Lily always loves it so I'm sure Ollie will too. When staying indoors does get too much then I plan to head out to The Rye, or maybe the woods behind our house and go for a walk. Depending on how awake they are, we might be able to spot some squirrels or there are ducks to feed (although I learnt the hard way that they really do prefer bread). Carrying on from number one, I also found this delight on Pinterest. One to try! This one came from Little Bins for Little Hands. 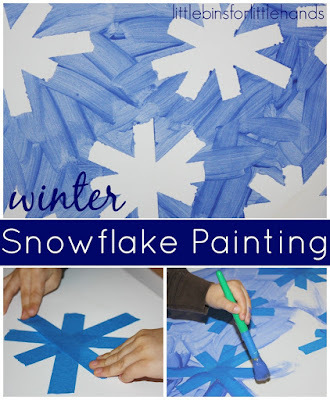 Just in case it doesn't snow, I like the idea of making some indoor snow! Or maybe I'll fall back on an old nursery-trick and get some ice for playing with. I used to go to a lovely session at our local Sure Start centre where the babies could play with treasure baskets. It's not on anymore so I'm going to hunt round and put together some mini baskets for heuristic play for Ollie. I think this will be a good activity for Lily to do for Ollie, she can help me find items and then play alongside. What about you? Do you have any plans for the rest of the month? Feel free to share with me in the comments! These all sound fun! My boys are almost 10 and 11, I miss the messy days when they used to want to do crafts with me!